I'm also tying this in to a new challenge which is being hosted by my friend Melissa. 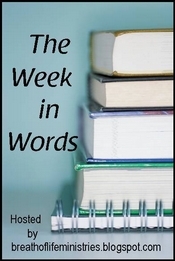 Melissa is hosting a Word Challenge on her site, Breath of Life. With this challenge she is hoping to raise a conscious awareness of the words that we read, to develop a greater love and knowledge of them. We can quote words from magazines, books, etc., they just have to be something that we've read. So without further ado, I'm going to quote (and then comment) on Anne. 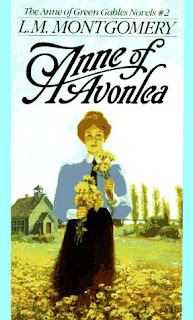 In this book we meet sixteen year old Anne who is beginning her teaching career at the Avonlea schoolhouse. Full of ideals, she sets about winning the hearts of her students (and of Gilbert Blythe) and makes a few special new friends like Ms. Lavender Lewis and Paul Irving. Twins Davy and Dora also show up on the scene. (Here I confess that I cannot STAND Davy Keith. Drives me nuts!) Anne's world has expanded beyond Green Gables and the surrounding trees and flowers and she is now becoming more aware of her community (hence the title of the book). Her friendship with Diana Berry, her 'bosom friend' has blossomed into something deeper and yet does not require as much of her focus. They are dear friends and they know this, but they have grown out of their childish requirements that the other constantly repeat their oaths of loyalty. They just are and I like that about their friendship, even though I miss the fact that Diana is busy in her own world. And I still don't like it when Diana falls in love with Fred. I always feel an inner pang of loss, just like Anne does. Engagements do require some adjustment in all relationships but we always forget that until we're in the middle of one. At any rate, I said this post was about quotes and not about a review, right? And I have lots and lots of quotes marked off. Let's see where they take us, shall we? "I'd like to add some beauty to life," said Anne dreamily. "I don't exactly want to make people know more . . . though I know that is the noblest ambition . . . but I'd love to make them have a pleasanter time because of me . . . to have some little joy or happy thought that would never have existed if I hadn't been born." Now, here is where I do not feel a kinship with Anne. It is wildly true that I am very glad that Anne was born and she has brought delight to my life. But I don't agree with her in thinking that her highest goal is also my own. I'm more of a "you don't need to like me, but I would hope that you could respect me" sort of a person and less of a "I hope I made your life more beautiful" one. That said, I have a friend or two who I am convinced make the world a happier place just because they were born into it and I think everyone would be blessed to know them. We don't all have that gifting, but those like Anne really are a blessing and I merely hope to recognize them when I find them. I love that Anne has obviously taken memories of her own life experiences and chooses to use them to minister to others. It reminds me of the book on grief I read recently that says first you feel misery, then you feel mercy, and then you minister. Anne reflected back on her own parent-less existence and wanted to be able to provide a stable, loving home environment for Davy and Dora. She is a remarkable example of someone who walked through great pain and extended great love. It took time and distance from her situation to be able to do that - but she did it. "And I don't think it's any help that it's your habit. What would you think of a person who went about sticking pins and needles into people and saying, 'Excuse me, you mustn't mind it . . . it's just a habit I've got.'" You'd think he was crazy, wouldn't you? And as for Mrs. Lynde being a busybody, perhaps she is. But did you tell her she had a very kind heart and always helped the poor, and never said a word when Thomas Cotton stole a crock of butter out of her dairy and told his wife he'd bought it from her? Mrs. Cotton cast it up to her the next time they met that it tasted of turnips and Mrs. Lynde just said she was sorry it had turned out so poorly." I think I'll not comment on their exchange and let you to personal application on whichever side you fall on. For surely we all fall on some side of it! I admit to living by ideal a great deal of the time. It's not that I believe I do or ever could live in a perfect world. I just tend to be one of those who thinks that anything is possible. Situations and circumstances may take some devoted study, time and attention, but it's amazing what things can turn out. I trust that God is always working SOMEthing out for my good and for His glory, even if it doesn't always look like it to me and others. I believe it because He said it. And that's all I've got to go on sometimes. But it's enough. Yes, Anne, I DO think so. I do indeed. In fact I don't think it's possible for me to agree more. I think that is also the case. Certainly I love days that are wild with excitement - fun things to do, places to go, people to see. At the same time, I'm learning to enjoy the simple days with just our immediate family, exploring the world together and being at peace. These days I'm finding joy in the quiet moments that are unruffled and undisturbed. There is beauty in these days and I'm learning to find it whether it be a successful potty training session, a book I finally managed to complete, a clean bathroom, an e-mail from a dear friend meant to bolster my spirit, or laughter born of tickle fights. Little pearls. I still think that passage is lovely and I'm happy to say that another Anne dream of mine came true in marrying Jonathan. Our relationship was first born of friendship (intense dislike ---> cautious friendship ---> definite friendship ----> love). It's a blessing when love comes that way, that's what! I love Anne and I love watching her grow up. I feel like I'm growing up at the same time, thinking about the lines, statements and conversations had from an adult perspective as opposed to thinking about them as I did when I was 14 and 15. There is more depth than I saw before. I realize I've only ever liked Anne. But now I love her for the truths she speaks and the dreams she believes in. Anne of Green Gables was a delight to me. Anne of Avonlea is an encouragement. Sigh. I can't get enough of Anne! We DID have one of the same quotes! I still haven't finished Avonlea yet. I'm only about halfway through it, but like you...Davy is NOT my favorite kid. Thanks for joining us. As always, I love your insight. I am reading it right now too! I was just reading last night, and I too was marking quotes. I am looking forward to rereading this. I finished this book a few days ago. Funny, I like Davy but Dora annoys me. It's been interesting to read these books again as a grown-up and mom. I like Davy, but I found myself always wondering about Dora. Why didn't Montgomery like her? Why include her in the story at all, if she was going to be so underdeveloped? Between you and Melissa...I think someone's trying to convince me to read the Anne books. :) I especially like this one: "We must have ideals and try to live up to them, even if we never quite succeed. Life would be a very sorry business without them." Oh, I so love Anne! I LOVE the Irving/Lewis story, too. I think Miss Lavender is one of my favorite of Montgomery's charcters. Hmmmm. . .the Dora/Davy debate. I think I probably like Davy better, which is odd because I typically don't like misbehavior AT ALL. But Dora doesn't seem real. I feel I must inform you that this person (ME) thinks her world is a more beautiful place with YOU in it! I love Anne. (SIGH) I'm gleefully saving her for the Dreaded Cruise. I loved re-reading some of these quotes. I haven't read Anne since I was a teenager, and that's a shame! Jennifer - I can't wait to see what quotes you mark. Everyone - I'd take Dora any day over Davy. That said, if I could offer a editing suggestion to Montgomery, I'd have requested no twins. They just feel distracting to me... like she needed children in her books so she randomly created them and threw them in. Anyway, I'm not a big fan of either but I favor Dora if I must choose. I love Anne quotes yet have never read the book. I need to get it on my list! Mine is finally up really, really late. It has been about 20 years since I have read Anne. Your quotes make me want to pick this up again. Aw, I love Davy and Dora! They're one of my favorite parts of AofA, next to Mr. Harrison. And my own twins bear a striking resemblance in personality to Davy and Dora. Personally, I've always had a huge soft spot for Davy, which should stand me in good stead over the next few years. Oh how I adore Anne too! I know I've read (and loved) this, but my mind is a total blank on Davy and Dora! I enjoyed reading these quotes and your thoughts on them. Sometimes I'm afraid to reread books I once loved, but it sounds like this one only gets richer. I just posted my review but wanted to come back and reread yours from last year. We used a few of the same quotes! But a few different ones as well. I loved the Lavendar/Irving storyline as well. I had completely forgotten about her as well as the twins. I didn't like the way Dora was treated in the book, as if being good and dutiful was dull. I love how Anne is maturing.